EYB did not index this book by page number unfortunately because the books TOC/index is just AWFUL. We finally found our recipe by blindly paging through the entrees section. ?? Quick and easy soup using mostly things I pretty much always have in the house. I usually don't bother with the tortilla chips. The author practically admits this was a one-off recipe made from what was on hand in her fridge, and it shows. Nothing particularly remarkable about the dish, but if you have a few vegetables you need to get rid of, this is one way to do it. Sarah returns with her first solo cookbook, featuring more of the delectable, easy-to-prepare recipes that vegans around the world have come to adore. For Sarah, vegan cooking—which eschews all animal products, including butter, milk, and cheese—can be an adventure in dining, without a lot of investment in time or money. 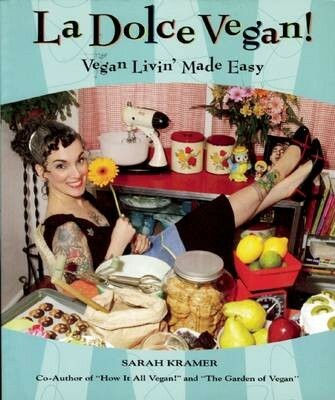 In fact, most of the recipes in La Dolce Vegan! can be prepared in 20 to 30 minutes or less. From soups and salads to entrees and desserts, they are sure to inspire both committed and part-time vegans alike. At the heart of the book is Sarah’s wholehearted commitment to the vegan lifestyle that has changed her life completely—from a childhood plagued with health problems to an adulthood filled with the pleasures and joys of living vegan. For Sarah, an animal-free diet will make you happier, healthier, and more content with the world around you. In addition to the wonderful recipes, there is a fun do-it-yourself section of vegan tips and non-food items. Learn to live the sweet life of veganism and you’ll never look back! Recipes include: Beauty and the Beet Borscht, Mocked Clam Chowder, Roasted Cherry Tomato Pasta, Sloppy Janes, Blessed Broccoli Stir-Fry, Apple Pie Pancakes, Carob Almond Truffles, and Tomato Soup Cake. Sarah Kramer is the co-author of How It All Vegan! and The Garden of Vegan. She lives in Victoria, British Columbia, with her husband, where she manages a tattoo shop in addition to creating her vegan masterpieces and maintaining her popular website www.GoVegan.net.